Following his failed invasion of Portugal in 1810, French Marshal André Masséna fell back into Spain with Wellington's Anglo-Portuguese Army in cautious pursuit. Assuming the wretched state of the French would allow him time to capture the key border fortress of Almeida, Wellington settled in for a leisurely siege. But Masséna quickly reorganized his forces and advanced on the British positions in an effort to resupply the beleaguered fortress. Advancing on Almeida on 3 May, 1811, Masséna encountered Wellington's army in strong defensive positions along the Dos Casas River. Heavy fighting erupted, with the British barely managing to hang on to the key terrain. The next day, Masséna scouted the area and discovered that the British right was dangerously weak; that evening he conducted a daring night march that put strong forces into position to roll up Wellington's flank. When the French attack struck on the morning of 5 May, the British right nearly collapsed, and only the sacrifice of the British cavalry and heroic performance of Craufurd's Light Division barely managed to save the day. The savage nature of the fighting and the peril to the British position was revealed in Wellington's statement after the battle, "If Boney had been there, we should have been beaten." 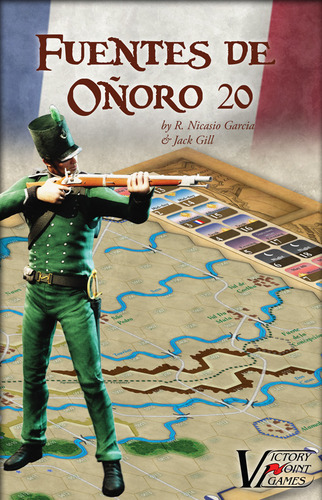 Fuentes de Oñoro 20, by designers R. Nicasio Garcia and Jack Gill, allows players to examine this tension-filled battle of the Peninsular Campaign, fought along the Spanish-Portuguese Border. Featuring the same system as GMT's popular "Fading Glory" game,Fuentes de Oñoro 20 has low unit density (20 pieces or less on the game map) and modest complexity. The game focuses on dramatic, fast-playing turns and creates a strong historical narrative through the use of random event cards and the tracking of army morale providing a great feel for the parry-and-thrust of Napoleonic grand battle. Lead your troops forward into action to see if you can break your opponent's morale at bayonet-point before he puts your army to flight.